Lactose is a sugar naturally found in some foods, particularly dairy products. Sugars require special enzymes that help your body break down foods. Those who are lactose-intolerant do not have the proper enzyme, known as lactase, to break down lactose, which can cause symptoms like bloating, flatulence, diarrhea and nausea. While most lactose-intolerant individuals can avoid dairy products, there can be a surprising lactose source: the medications you take. Lactose is used as an inactive ingredient in medications, meaning it does not affect the condition for which you are taking the medication. Instead, lactose is added to medications as a filler. Fillers are used to give a medication a certain consistency or texture to make it easier to swallow or form. Lactose is mostly added to medications like tablets and capsules. An estimated 20 percent of prescription medications and 6 percent of over-the-counter medications contain lactose, according to eMedTV.com. Many birth control pills contain lactose as a filler. Medications to treat stomach problems, such as those for the relief of acid reflux and gas, also may be made with lactose. Calcium chews used to supplement your daily calcium intake also may contain lactose. However, calcium pills do not always contain lactose -- ask your physician if you are unsure whether you can safely take these medications. For most people who are lactose intolerant, digesting a small amount of lactose should not have adverse effects. Lactose-intolerant individuals can typically tolerate about 12 to 18 g of lactose, which is the equivalent amount found in an 8 to 12 oz. serving of milk. Medications typically have much less than this amount, meaning they should not cause discomfort. 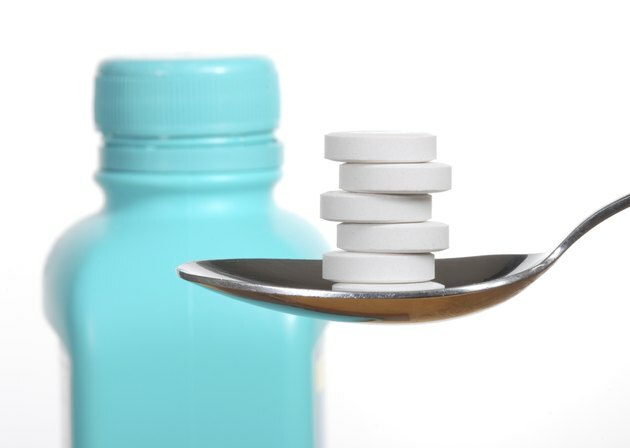 However, if you are taking multiple medications, the combination of lactose may upset your stomach. If you are extremely sensitive to lactose, you may experience difficulties taking these medications. Watch for signs like stomach pain, gas, diarrhea or nausea after taking a medication. If you do experience these symptoms, you may wish to take a lactase enzyme supplement, which can help your body break down medications in lactose. Probiotics, which also are available over the counter, may help as well. If your symptoms persist, your physician may prescribe a different medication or different medication formulation.